We all like food, right? However, do you know what food is best? Free Food! Doesn’t just hearing those words invoke this intrinsic hunger in you? But where can we find some of these delicious treats in the school? Have you ever wondered why every day during break, there is a line jam-packed with students in front of the circulation desk? Well that’s because it’s a free food jackpot. Chair of the Middle and Upper Division Libraries, Caroline Bartels along with Stiffany Aponte, the Head of Library Circulation, and Melissa Kazan, the Library Technology Coordinator, prepare countless free snacks every day. I’m assuming these are the correct titles but can you double check? Students have been able to enjoy an assortment of free snacks like crepes, chocolate covered bananas, strawberries, pineapples, fruit roll ups, pretzels, s’mores, and more. While you can always pick up a free snack during break in the library, sometimes, you may want a snack during another time. Don’t worry, there are still many other locations with free food! Some veterans like Harry Porges (11) have spots that he visits regularly. Before English class, Porges often stops by the Testing Center on the first floor of Tillinghast to grab a few pretzels sticks or candies that Mr. Jesse Shaw, Testing Center Coordinator, always puts out for students and teachers. We all know eating food calms people down, so to alleviate the stress of hunger, our Guidance and Counseling Office has also provisions for hungry students. Another expert of finding free food gave some more mischievous advice. He recommended to go to the Music Office when there’s a concert. Often times, he would sneak some of the food for the musicians. 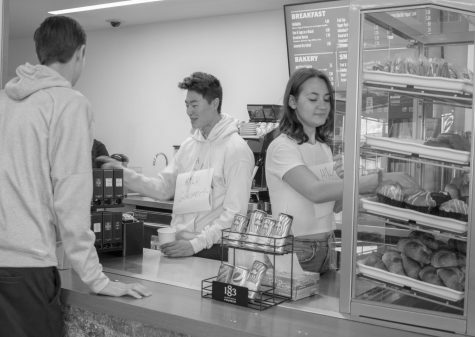 Next time you’re hungry, maybe instead of going to the cafeteria, stop by one of these spots, because free food is always better and this school has no shortage.